Kevin Durant of the Oklahoma City Thunder dunks the ball against the Phoenix Suns at the Chesapeake Energy Arena in Oklahoma City. 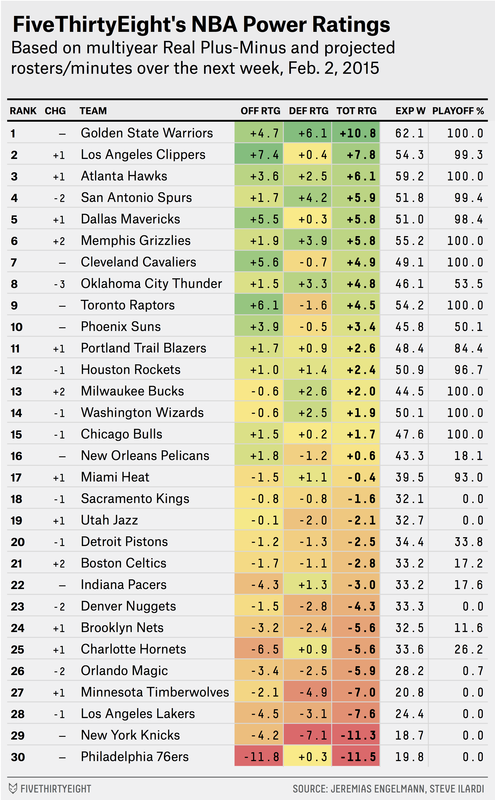 Welcome to another edition of FiveThirtyEight’s NBA Power Ratings. Teams are ranked according to a projection of their strength over the coming week using Real Plus-Minus (RPM) player ratings provided by Jeremias Engelmann and Steve Ilardi. For a more detailed explanation of the process behind these numbers, see our first rankings post. The Oklahoma City Thunder are in a bit of a precarious position. After losing two of their three games over the past week, they occupy the 10th slot in the Western Conference standings. And despite the talent on hand, our simulations give them just a 53.5 percent probability of making the playoffs, down 19.1 percentage points from a week ago. It’s no coincidence that over the same span, the Phoenix Suns won two of three to move four games clear of Oklahoma City. The Suns’ playoff chances rose by 10.5 points to 50.1 percent. Sandwiched between Phoenix and Oklahoma City in the West standings is New Orleans, but the Pelicans check in with just an 18.1 percent probability of making the playoffs. Why? They have neither the Suns’ advantage in the standings nor the talent edge of the Thunder. That said, New Orleans is improving on both counts, winning two of three over the past week. The Pelicans’ projected rating is 1.1 points per 100 possessions higher in this week’s power ratings, thanks to progress on offense. Why did the San Antonio Spurs drop a two slots and lose a league-high 1.9 points per 100 possessions from their rating? Blame Tony Parker (mostly). Parker is struggling to find his form after a hamstring injury earlier in the season, and he has one of the league’s worst RPM ratings this season (which only got worse after a rough performance in the Spurs’ 20-point home loss to the Los Angeles Clippers on Saturday). The playing-time projections for our ratings see Parker logging more minutes this week, so the numbers view him as personally responsible for nearly half of the Spurs’ projected decline. As bad as my hometown Philadelphia 76ers have been this season, something jumps out about their coterie of ratings at the bottom of the table: Their defense is above average! The decidedly poor offensive RPM numbers of Nerlens Noel (-5.0), Luc Mbah a Moute (-3.6), Henry Sims (-3.5), K.J. McDaniels (-3.4) and even Michael Carter-Williams (-2.5) hides a collection of pretty decent defenders. For instance, Noel’s defensive RPM (+2.2) is roughly equivalent to that of DeAndre Jordan, who finished third in last year’s voting for defensive player of the year. Of course, the Sixers are still awful, and that means their offense must be especially bad to offset an above-average defense. Sure enough, they’re tracking for the worst offense (in terms of offensive rating relative to league average) in the history of major professional basketball.